This neat and tidy garden building shows that little sheds can bring big advantages. 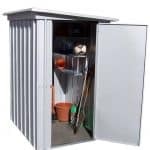 It’s a perfect storage solution for people whose garden space is at a premium yet are looking for a convenient place to store their tools and equipment. Although no padlock is included it is padlockable, and the absence of windows means that nobody will be able to see what’s kept inside, making it more secure. We were pleased that the manufacturer has provided a 10 year guarantee, as that provides extra value for the consumer as well as giving them peace of mind. This generous warranty can be provided because of the zinc plating on the steel cladding, as well as the nature of the pent roof which ensures that water can’t sit on the surface. 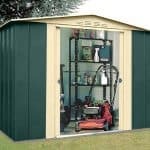 If you’ve never owned a metal shed before, you’ll be surprised by the advantages they bring. This shed was easy to construct, without the need to saw or finesse components to create a perfect fit, and we were impressed by the handy inclusion of a floor support frame. There’s also no need for further treatment from the owner, which can add up to a significant saving of time and money over the years. We like storage sheds such as this that feature pent roofs, as it is a big help in the fight against rust and water ingress, while still giving a relatively even distribution of space inside. 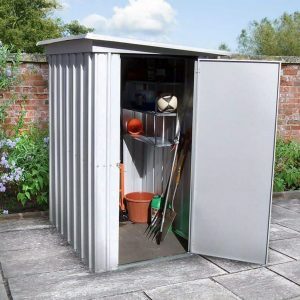 For a metal shed, it’s surprisingly good looking thanks to the zinc finish which can look almost white when the sun is upon it. Unusually, the roof slopes from left to right rather than front to back, and at its maximum height the roof is 1.74m, backed up by an eaves height of 1.60m. The overall width of this shed is 1.20m, and the overall depth is 1.58m. These are also the dimensions that you’ll need to keep in mind when selecting a level area to use as the shed’s base. We were pleased to see that the cladding used on this shed had three distinct layers, giving it added protection against the weather. The core itself consists of a tough steel with a thickness of 0.35mm. This is then topped with zinc plating which is itself then topped by a clear resin. These last two layers help to stop water from reaching the steel itself, making it very rust resistant. 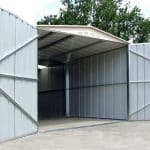 They also ensure that the structure as a whole is solid and rigid, which is always a concern of ours when we review lightweight metal sheds. 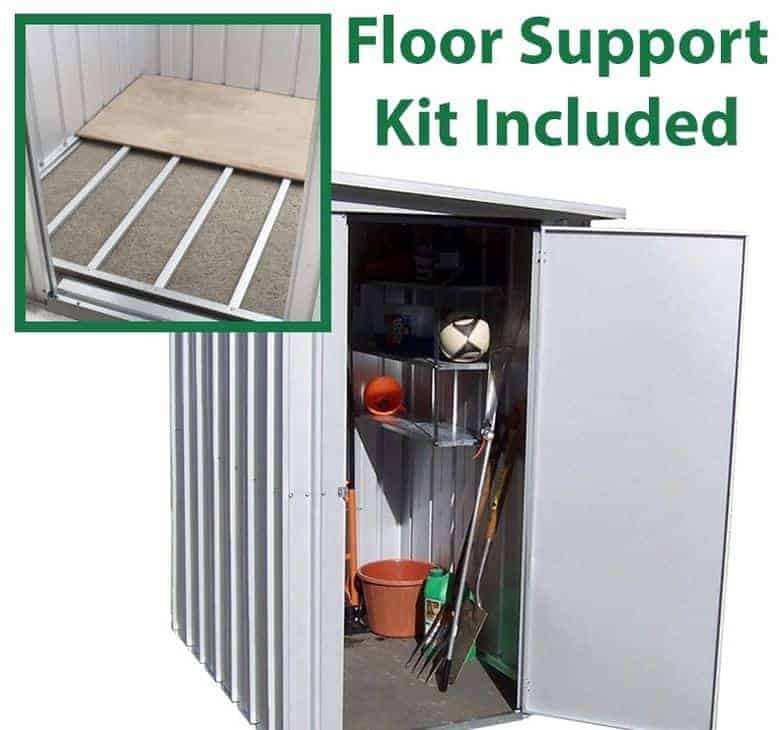 Whilst no flooring was included, which is not uncommon with metal sheds that are intended to be fixed onto pre-existing concrete, it was good to see that a floor support kit is supplied as standard. This creates a metal frame upon which a wooden floor can be placed. Because this floor will then be slightly elevated it counters the potential problems caused by rising moisture from the ground. When we see a 10 year manufacturer’s warranty on a metal shed, as on this one, it’s always an affirmation of the quality of components used during fabrication. That’s why it will be especially reassuring to owners of this shed, especially as the only treatment that they’ll have to carry out during this time is periodic cleaning to reduce the risk of algae appearing. 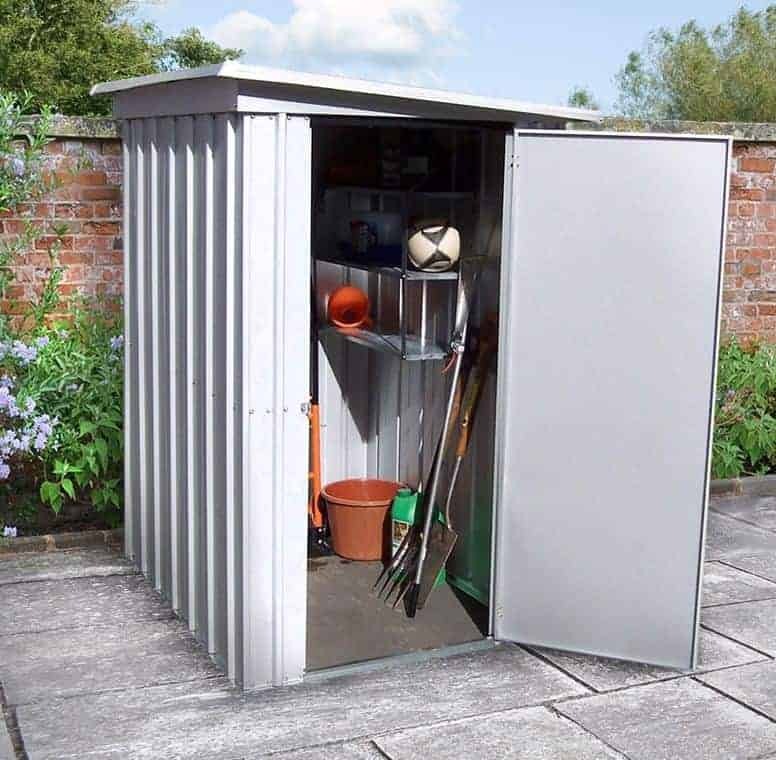 We often see metal sheds of this size without windows, as is the case here, but in itself this isn’t a bad thing as it gives added privacy which in turn can act as a security feature to combat opportune thieves. The door of the shed dominates the front facia, which is good as that means that it offers more space to enter and exit through. Even so, we did have to stoop to get through the opening that is 1.58m tall and 0.60m wide. The pad bolt on the door is purely for fixing it shut, although it can accept a padlock if one is purchased. We would have liked to see further security measures incorporated into a shed that has been designed for use as a handy storage facility, but we appreciate that that would be unusual in a shed of this place. Nevertheless it was good to see that the pad bolt was padlock ready, and the lack of windows also aids security by keeping the contents of the shed hidden from sight. 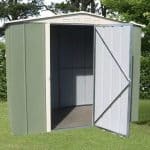 The main optional extras available with this shed are for storage purposes. These include a wheel bearing tool rack, so that you’re never at a loss where to find the tool you need, and free standing shelving. We liked this shelving unit as it has four separate levels, and with dimensions of 0.76 X 0.51m it can hold a lot. Other options available are a wheelbarrow and an outdoor water station. We can recommend the water station to consumers who are looking for a greener way to water their garden, and it fits neatly inside the shed when not in use. 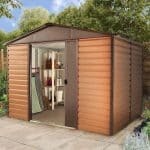 We were really impressed with the quality of this budget priced shed. The components fitted together perfectly, and the zinc plating adds strength. Each of the cladding’s three layers adds extra strength and weather resistance which, helped by the pent roof, is why it’s guaranteed free from rot for at least 10 years. 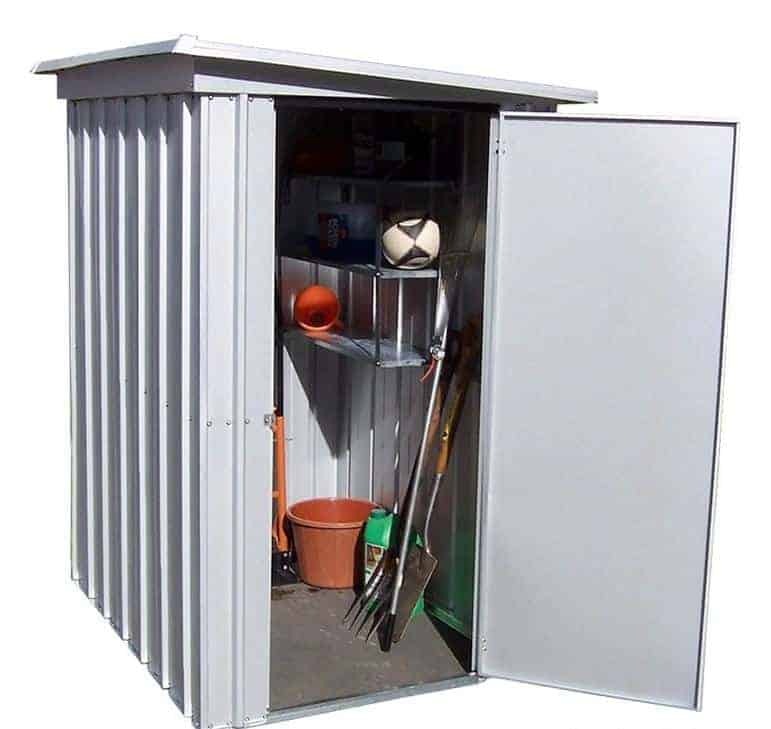 This shed is the smallest within the Yardmaster range, yet will still offer useful storage space to those with a smaller garden. Putting this shed together was very easy, and the instructions were simple and yet thorough. You and a friend can expect to complete the installation within four hours if the instructions are followed methodically. Whilst this is a low cost metal shed it is possible to get ones with slightly more storage capacity for a similar or lower price. This provides extra value for money, however, because of the floor support kit supplied as standard. Final Thoughts: Some people only need a small storage facility to keep a lawn mower, spade, and a selection of garden tools. 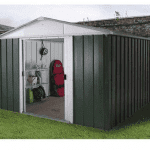 If that sounds like you, then this Yardmaster metal shed could be a perfect solution. It’s quick to install and, thanks to the supplied frame, it’s also easy to use a few decking boards as a wooden floor if you prefer that to a concrete base. 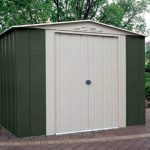 Rust is kept away thanks to zinc plating and resin coating, and even the screws used to secure the shed are rust free. That means you won’t have to worry about it taking on a shabby appearance as the years pass by, and it also ensures that the contents within the shed are kept dry.